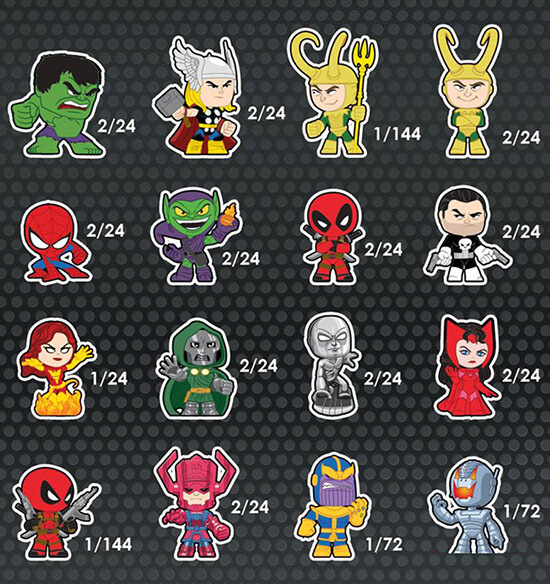 2014 Funko Marvel Mystery Minis offer some of the first blind box format vinyl figures of the Marvel Universe. Featuring a large lineup of both heroes and villains, the small toys are both easy to collect and play with. Collectors have a total of 16 figures to chase in the debut Marvel Mystery Minis line. It has a who's-who of good guys (and gals) and a few classic antagonist. But with such a rich universe to choose from, there are still plenty of other characters left for future sets. 2014 Funko Marvel Mystery Minis stand approximately 2.5" tall. Each is packaged in such a way that you don't know who you're getting until you open it. They're also designed to be mini bobbleheads. Most are inserted two per 24-box case. That said, not all are available in equal numbers. For example, Phoenix is inserted 1:24 boxes, or one per case. This jumps to 1:72 boxes for super villains Ultron and Thanos. The toughest figures to find are weapons-holding variants of Loki and Deadpool. These are very tough to find, landing 1:144 boxes. Funko Mystery Minis MARVEL SDCC EXCLUSIVES Set -Check it out - 8 unique figures! That is Deadpool… NOT Daredevil. 2014 SDCC EXCLUSIVE FUNKO MARVEL MYSTERY MINI BRAND NEW UNOPENED CASE OF 12.